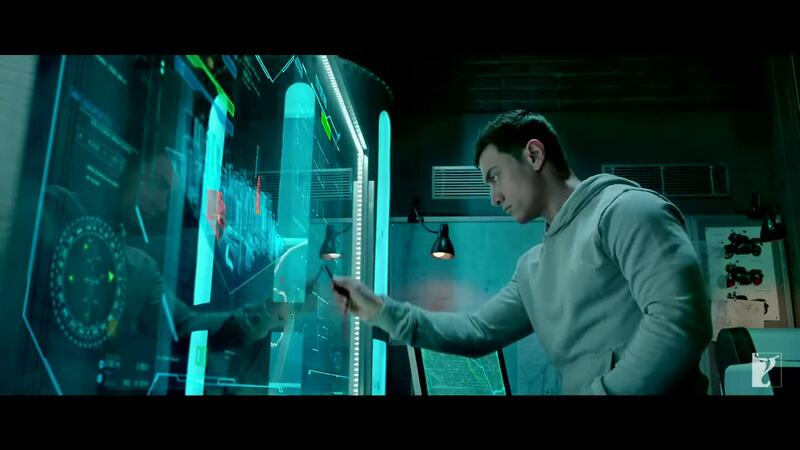 Dhoom 3 is a Bollywood thrill ride that hits all the notes needed for a satisfying big budget spectacle while keeping the flaws to a minimum. Because it is so big budget, you can expect the same types of goofy plot logic that the typical American big budget spectacle has. 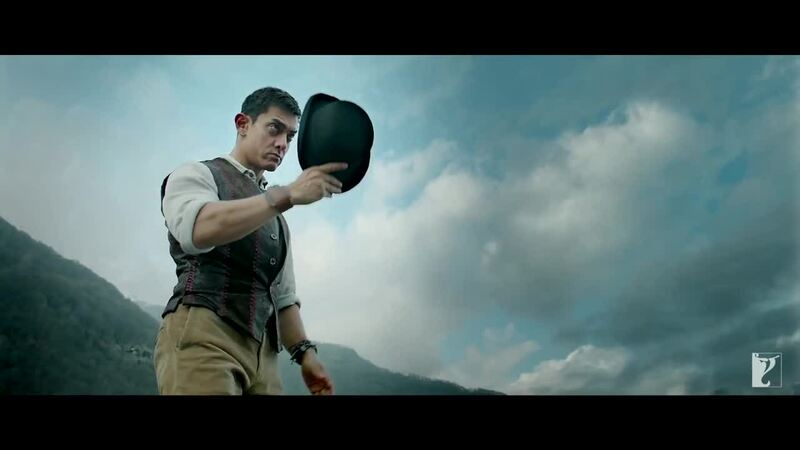 Dhoom 3 scored a semi-mainstream US release, which is really rare for a Hindu film. Going to see it in theaters and being the only non-Indian in the audience is one of those things you can’t pass up, especially if you don’t live near a theater that regularly shows Indian film. The big budget razzmatazz has some of the typical Bollywood hurdles, and does some other things a bit weird. 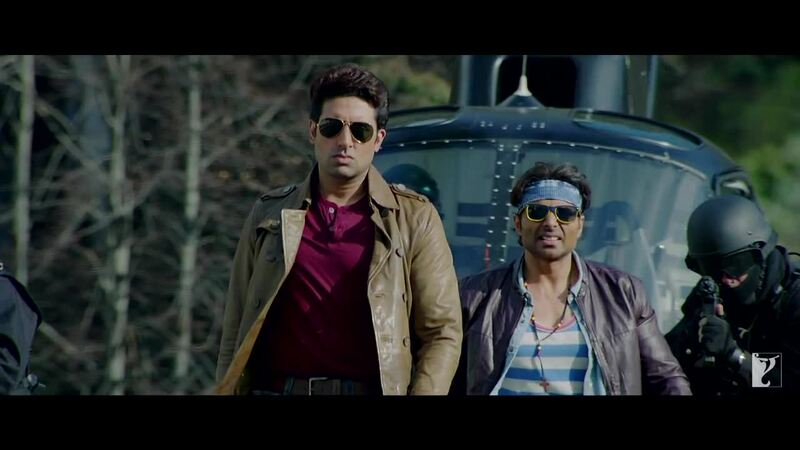 Things begin to drag in the second half during some of the character development scenes, especially Abhishek Bachchan looking awkward as Jai Dixit goes undercover. The opening sequence is just plain weird. Jackie Shroff as Iqbal Haroon Khan, Sahir’s father, desperately putting on a show of The Great Indian Circus to convince the bankers led by Anderson to get a bit more time paying back the mortgage. It’s doesn’t work (because they’re bankers, and thus inhuman monsters! ), but blowing your brains out in front of your child is pretty much the worst response. 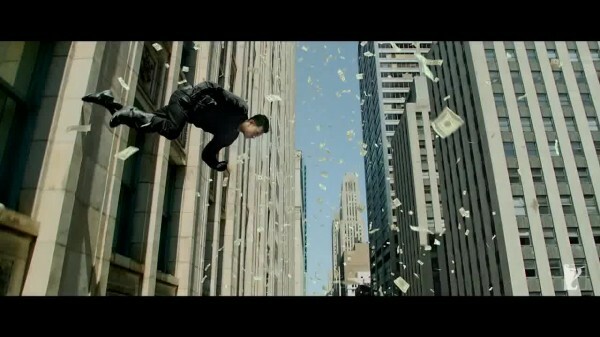 Sahir Khan (Aamir Khan) is the magical criminal robbing the branches of a bank in Chicago. He’s magical in that he is a magician, not that he has actual magic powers (beyond the superhuman abilities everyone has in Bollywood!) Whether he’s running down the side of a building while thousands of $100 bills fall from the sky or riding a motorcycle across a rope strung between two buildings, Sahir makes it look good. He’s got a purpose for his madness, and the reason why he’s targeting a specific bank and leaving mocking notes in his wake. As a child his father’s Great Indian Circus was foreclosed upon by the bank and his father shot himself in from of him. 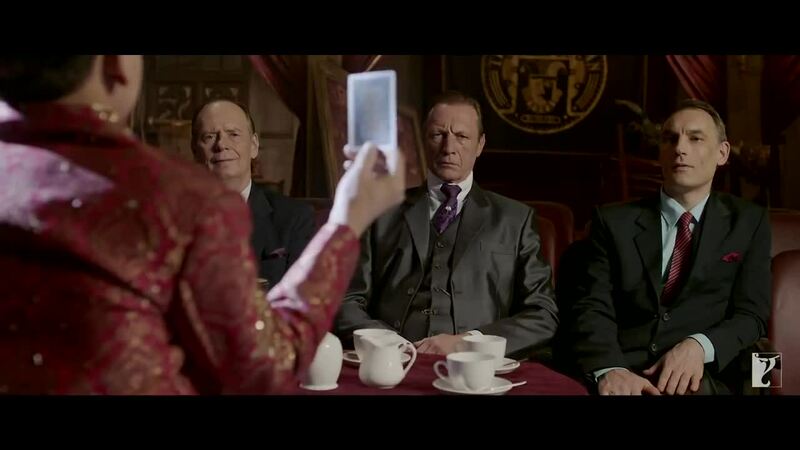 As lives were ruined, Sahir sets out to return the favor and ruin the lives of the bankers. Mr. Anderson is the owner of the bank, and he’s evil. He’s so evil he literally says at one point that “we’re bankers, everyone hates us!” when asked about enemies. When he’s not bragging about being evil and ruining lives, Mr. Anderson talks about making money and sneers, or sneers and talks about making money. It takes a Bollywood film to finally have old white business suit wearing banksters as the enemy, even if he’s not the “enemy” and the hero cops are technically helping him. But he’s the real enemy. Mr. Anderson makes Mr. Potter from It’s a Wonderful Life look like George Bailey. Abhishek Bachchan returns as super cop Jai Dixit, joined once again by his loyal comic relief sidekick as Ali Akbar (Uday Chopra). Ali Akbar does occasionally become the super cop, during the very few scenes that aren’t created to showcase just how awesome Jai Dixit is. As the duo travel to Chicago to help with the case, there is no need for any other characters from the prior entries to show up. Shockingly, the bank has done nothing with the property that The Great Indian Circus played at until Khan uses money he robbed from the bank to buy the building from the bank, and he starts up the circus again. But he’ll need a star. Enter Aaliya (Katrina Kaif), who dances and sings her way into the starring role, and into an object of interest for Aamir Khan’s character. But despite that, her character isn’t that well developed. Enough other characters and plot threads going on she just gets put on the back burner. And it is a Hindi action film, which aren’t the best source for powerful female roles. The other major female role is Tabrett Bethell as Chicago Detective Victoria. She becomes a sort of fantasy love interest for Ali, though she’s missing from huge chunks of the film and never seems to be at any of the battle/chase sequences. 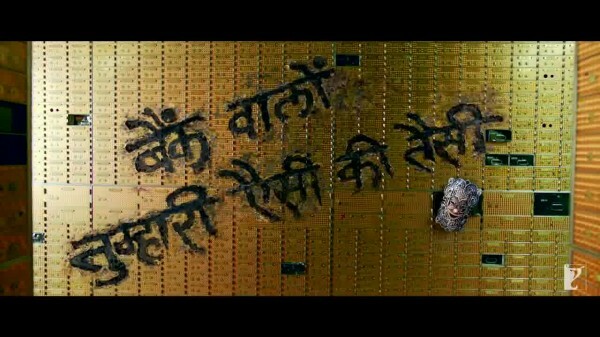 Shockingly, this is far from the worst portrayal of women in an Hindi action film. But it is a white woman in an Indian film in a non-offensive and love interest role. 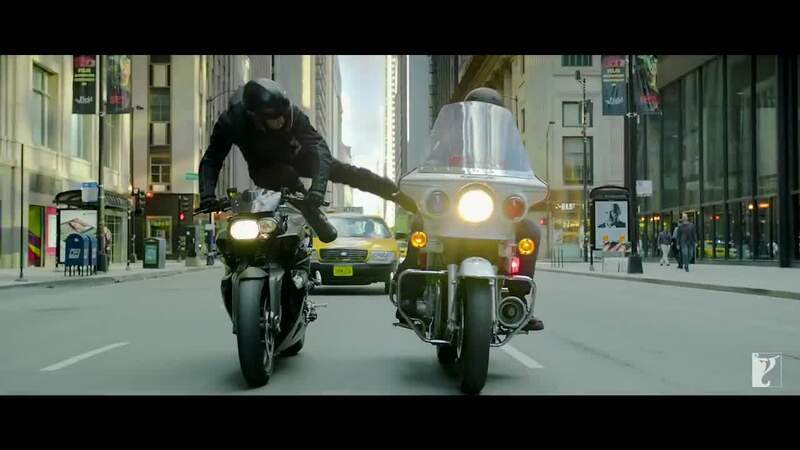 The stunts are the main attraction and Dhoom 3 brings the goods, with several fun chase sequences using Khan’s magical transforming motorcycle, which can become a hovercraft and even has rocket boosters! There is plenty of motorcycle fu going on, luckily it is all in slow motion so the heroes have time to duck and not be slammed by an entire motorcycle! The sequence where the police are introduced in India is more than a bit ridiculous, but at least bricklayers in India will never be short for new business, as anyone cop or criminal can just crash through walls willy-nilly. Don’t worry, crashing through a brick wall just leaves you slightly dusty. Try it today! There is a big twist right at intermission, which is obvious and often-used in retrospect, but I was thinking it would be something a bit more magical. I guess the whole distraction thing worked. But the game changes after the twist is dropped and character development begins rearing its ugly head. Chicago is well-represented, even those of you not from Illinois will recognize places from The Dark Knight. 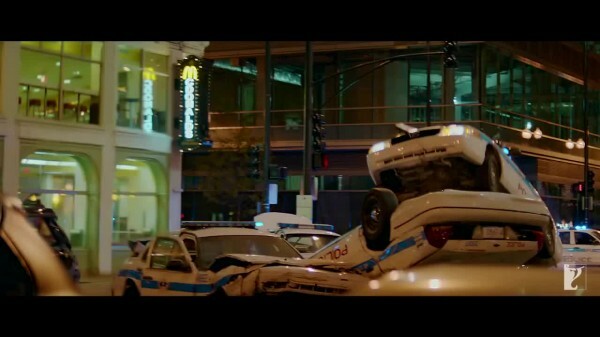 What I can only assume is an homage to fellow Illinois-set movie The Blues Brothers happens during one of the chase sequences as cars go flying all over each other. Maybe Illinois should get a new company to do the brake inspections on police cars! There is no huge dam in Illinois (except the lock and dams on the Mississippi, and they look nothing like what looks like huge dam in the scene) and the one in the film isn’t even in the US! 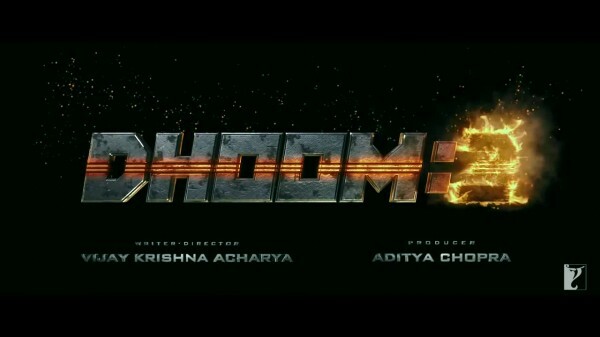 Dhoom 3 is a fun but flawed action spectacle that is a nice introduction for those unfamiliar with Hindi action films. The circus-themed sequences help showcase some of the Bollywood excess in a way more accessible to American filmgoers, while still providing all the visuals that is a hallmark of the music videos. I support more diverse theater experiences, and want to pump up the numbers of all entertaining cinema from whatever country that’s at the local box office. Hopefully Dhoom 3 leads to more Hindi and Indian films being released in US theaters, but until then, go get DHOOMED!